Hoisted the jib up the foil today (yes, it's nearly September and this is me getting the boat ready for this season) and the furling drum decided to part company with its housing. Not pretty! Ah well most people use too much halyard tension anyway. 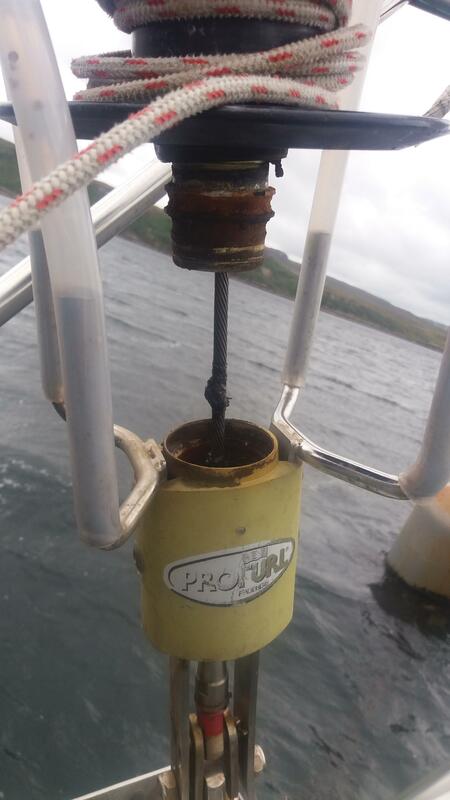 I think this damage actually happened last year when the furling line jumped off the drum and wound around underneath it, forcing the drum upwards. Hence my addition of some classy rubber hose to extent the stainless keepers. Anyway, what do I do now? I'm planning on replacing the standing rig this winter anyway if that helps. And I have a removable inner forestay so could drop the foil completely if needs be. Yes I was just digesting that page, quite useful. I'll need to work out exactly what model my Profurl is- I don't recall seeing it anywhere, but there's a manual somewhere. Am I right in thinking that the only thing stopping the furler pulling apart is a circlip above the bearing? I had assumed it might be a little more complex than that. Alistair- were you able to source stainless bearings? I'm a bit less afraid of this task having recently rebuilt my raw water pump using parts from Bearings Direct. Aye, I fitted 2 off 61808 2rs [6808 2rs] 40x52x7w Stainless Steel Bearings + 40mm seals. I reckoned that sealed bearings + seals was belt and braces. The detritus that fell out was certainly not stainless! And yes, the circlips are all that keeps it together. Thanks for that- things are looking up! After a bit more Googling, I think I *may* have a R25 model- although I'll need to get back to the boat and check some measurements. I'm a bit daunted by trying to measure the diameter of the parts needed- perhaps Profurl can tell me this though? I reckon I should be able to remove the offending parts by disconnecting the forestay at the stemhead, without dropping the whole forestay. Inner forestay plus a couple of halyard should keep the stick sticking up the right way. Watch out when you remove the screws holding the drum and gubbins to the foil - mine tried to consign the internal packing pieces to the noggin. If yours is as old as mine there are no spare parts available from Profurl. Wondered why mine was not unfurling as easily as usual - had a look, found a kink in the foil right beside an annular crack emanating from the feeder stopper screw. Hasn't actually let go yet but only a matter of time before I have a two-part foil. I reckon it can only be about 20 years old. If Rob gives up the near impossible, needing a degree in engineering, manual dexterity of a brain surgeon, strength of a heavyweight weight lifter, task of bearing replacement, I am happy to take the remains off his hands! Frankly I'm shocked that someone who takes their racing as seriously as you do thinks a furler has any place on a boat in th first place. I need the extra 1/2 minute the furler gives under CYCA handicap rules. Also, despite rumours to the contrary, Marisca spends most of her time, when not sitting on a mooring, cruising around with just me on board. Raising, lowering and packing a genoa single-handed is a bit of a faff as is changing headsails when the wind changes. Could people scour their winter quarters for discarded Profurl foils, please? - I only need one section. Yours for 1/3 of the Harken price - seems a generous offer?